Crazy Canadians. 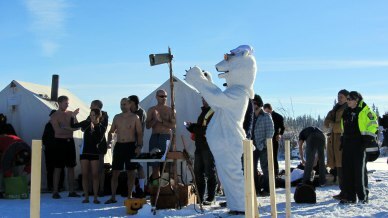 Polar bear swim in Calgary last year. Next year, Sue at Travel Tales of Life will take a dip for this worthy cause. The group that organizes this event is Servants Anonymous Foundation; an organization fighting human trafficking and exploitation. Great job Dave and Sue for your volunteerism! The polar bear refused to jump in. Elvis, Superwoman, Captain Canada and Tuxedo Man all leapt into the frigid water to raise money for Servants Anonymous Foundation; an organization fighting human trafficking and exploitation. The bear could not be convinced no matter how great the cause. 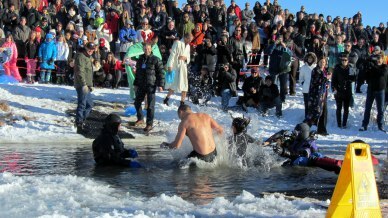 In Canada polar dips or plunges have become common on New Years day. Perhaps a growing health care trend in checking heart function for the upcoming year…. if you don’t have a cardiac arrest on the spot you are clear for the next 365 days. Such polar dips here often are associated with a charitable cause. Hubby and I were there volunteering for this one; I signing up the dipsters, he pulling them out of the freezing pond.